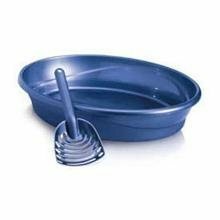 Dosckocil Petmate oval cat litter pan comes with micro ban antimicrobial. Made of durable plastic for long service life. Attractive styling to match any home decor. Measures 20-4/5- length by 16- width by 4- height.